Web-Based Secure Electronic Form. Ten easy questions (with translation available). Include as part of your onboarding process. Accessible via browser or mobile phone, and can integrate with your Applicant Tracking Software or Electronic Onboarding. Mail Us Your Paper Forms. CMS customizes the WOTC Questionnaire and simplifies it for your new hires. Simply mail us your forms within the 28-day window. CMS screens every new hire for eligibility, so you don’t have to. We also automatically check addresses and zip codes to determine eligibility for Enterprise Zone credits. Whether you have one location or one thousand, CMS can support your team. Our mission is to find you WOTC tax credits, and make it both easy and convenient for you, and your new hires as possible. Don’t leave tax credits on the table. 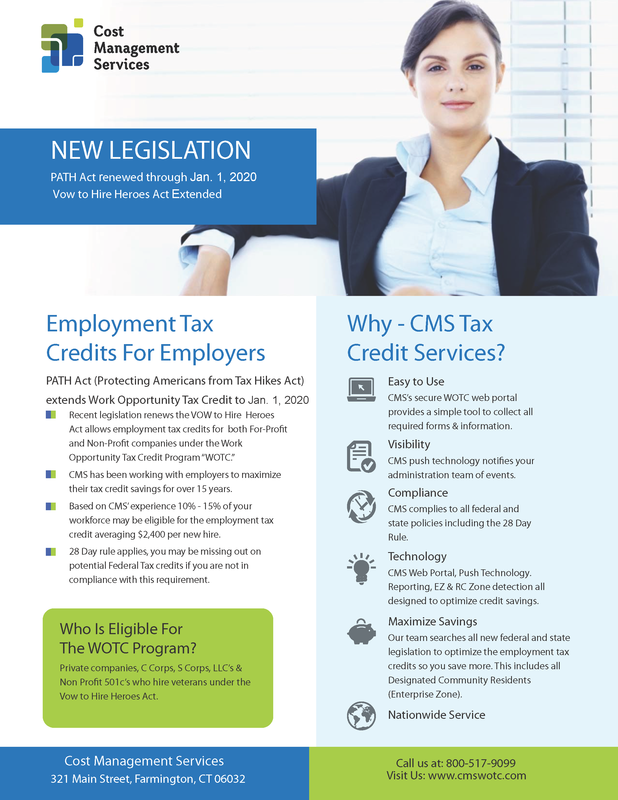 Call a Work Opportunity Tax Credit Expert Today 1-800-517-9099.